Outrageous Rose (Rosa ”Outrageous”) - Assists experiencing balance and harmony in your life by working through the energetic circuitry of the brain that balances intellectual and emotional functions. I AM balanced intellect and emotions creating harmony daily life. Outrageous Rose is a floribunda hybrid rose from Jackson and Perkins. Its truly outrageous blossoms are peachy-orange, tinged with yellow and have a honey-lemon scent. Difficulty translating symbols into reading, playing the piano or typing. Lack of physical coordination leading to difficulty with walking or playing sports. Difficulty with memory. Feeling divided. Strong unbalanced emotions. May be helpful for people on the Aspergers and autism spectrum. The two hemispheres of the cerebral cortex of the brain share information through the corpus callosum, an arched bridge of nerve tissue. The limbic (mammalian) part of the brain relates to emotions and memory. Disruptions in the communication between the two hemispheres of the cerebral cortex through the corpus callosum in conjunction to disruptions in the limbic system can lead to the above-mentioned symptoms. Outrageous Rose Flower Essence works through the energetic pathways that facilitate communication through the two brain hemispheres and the limbic system. This facilitates processing what is actually happening from a place of balanced intellect and emotions. Outrageous Rose Essence strengthens the connection between mind and Spirit and leads to experiencing balance and harmony in your daily life. 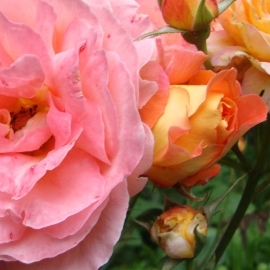 Outrageous Rose Flower Essence was made by the no-pick method of working directly with the plant spirit. While the essence was being made, a matrix of amber, amethyst, barite, blue fluorite, drusy quartz, hemimorphite, icosahedron cut quartz, purple fluorite, purple (lithium) quartz, pietersite and Tibetan black quartz crystals were placed among the plants with the mother bottles. Amber acted as a lens to receive and focus sunlight for this purpose. Amber also aligns the subtle bodies with the physical bodies, transmutes negative energy into positive energy, and emits a sunny and soothing energy that calms and enlivens the disposition. Amethyst brings peace and contentment to daily life. It transmutes dysfunctional energy located in your body and energy fields then enhances communication between your personal energy fields and spiritual energies. Barite enhances memory and assists with balancing brain chemistry. Blue fluorite promotes orderly, sequential thoughts enabling you to stay focused and directed toward an intended purpose. Drusy quartz crystals help to energize and stabilize your subtle bodies. Hemimorphite calms your emotional body, allows you to be present with your emotions with compassion and connects you to your inner Light. Icosahedron cut quartz has 20 (5X4) equilateral sides. It is a bridge between the 5th Dimension - the entry into the unified Spiritual realms - and the 4 cardinal directions (N, S, E, W) on Earth. Purple fluorite purifies the mind, enhances mental acuity, brings a logical and conscious awareness of the mental processes about how one thinks. It enhances the devotional aspects of the mind that connect with Spirit. Purple (lithium) quartz calms the mind and opens the heart. It facilitates release of worry, stress and anxiety and assists you to move into a sweet heart-centered space. Pietersite balances the mind and reconnects your mind with Spirit. Tibetan black quartz resonates through the crown, 3rd eye and heart chakras, helping you to embody your Higher Self and to communicate with the higher frequency planes of consciousness. It clears debris from your energy fields, creates a bubble of Light around your body, and moves energy blockages allowing for Light to bath your body down to the cellular level. The actions of the crystals inform the way this flower essence seats into the body/mind. While the Outrageous Rose Flower Essence was being made, barred owl feather and the sound of rattle and spirit song coming through Diana’s voice were imprinted into the essence.